Teknor Apex is showcasing Medalist compounds at this year’s MD&M West. There are three new medical-grade thermoplastic elastomers (TPEs) for biopharmaceutical tubing. The company says it provides superior performance to the industry standard TPE, making them alternatives to silicone. Teknor Apex recommends three compounds for challenging tubing applications in the biopharma industry for peristaltic pumps and extreme low temperature applications. It claims in comparison with the industry-standard TPE alternative to silicone, the Medalist TPEs exhibit lower levels of spallation—the shedding of particles from the inner and outer surfaces of the tubing caused by repeated compression and release during pump operation. Medalist MD-12352; a 52 Shore A translucent TPE designed for peristaltic pump tubing. Medalist MD-50357; a clear, slightly harder TPE (58 Shore A) for peristlatic pump tubing, which can be sterile welded and heat sealed. Medalist MD-10353; is a clear compound used in biopharma tubing in extreme low temperature applications. With a brittleness temperature below -60° C, this TPE can be used for tubing that remains flexible and elastic, facilitating fluid transfer in the manufacturing process of heat-sensitive biopharmaceuticals. The compounds can be sterilised by means of e-beam, gamma irradiation and ethylene oxide (EtO). 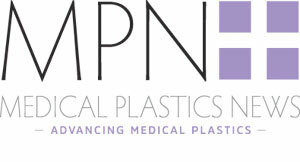 MD&M West takes place until 7 February at Anaheim Convention Center.